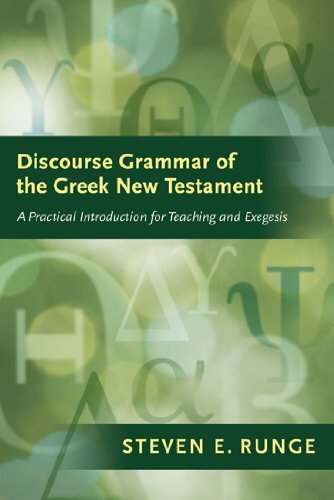 Of the eleven new books on my shelf, Steven Runge’s Discourse Grammar of the Greek New Testament is the one I’m most excited about. First of all, it continues the line of valuable Greek reference tools that have a green cover. So it’s obviously in good company with Bauer-Danker-Arndt-Gingrich, Daniel Wallace, Stephen Levinsohn, and the Loeb Classical Library. If you know anything about what my latest research has been in applying discourse linguistics to the interpretation of the New Testament, you’ll know why I’m so excited. Too often, exegesis is limited by a narrow view of the meaning of words and sentences without considering how those words are used in the wider contexts of whole discourses with patterns of use within a language community (and even patterns shared cross-linguistically). Many have touted the benefits of discourse linguistics for exegesis, but it looks like this might finally be the work to bridge the much-needed gap in introducing the theory to a wider audience in the academic world of New Testament studies. It’s a great book. I had the pleasure of contributing some of the technical editing of it. I’m glad that you’re excited about it, bzephyr.